Forget using your fingerprint to unlock your phone - how about using your eyeball, Minority Report-style, instead? 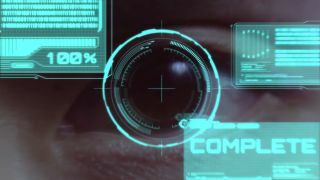 That's the future being promised by Fujitsu, which has been busy showing off its latest iris-scanning technology at Mobile World Congress in Barcelona. This isn't the first time we've seen this type of tech - check out a similar idea floated by Viewsonic - but Fujitsu says its system is at an advanced stage and could be rolling out in smartphones sooner rather than later. The prototype on the exhibition floor at MWC weighs less than 1 gram and fits on top of a regular smartphone. It contains a miniature infrared LED light and a miniature infrared camera. Once users have registered their retinas, the phone can be unlocked in less than a second. The iris recognition algorithm has been developed by a California company called Delta ID, and according to Fujitsu the error rate is roughly 1 in 100,000 - just make sure you don't blink. The technology could be ready to go this time next year, Fujitsu says, giving us yet another secure way to unlock smartphones, log into online accounts, and make payments on the go. There's an online demo video showing off the system too. "This device can be used to unlock applications and for cloud authentication," Fujitsu's Takuya Kitamura told PC World. "Fujitsu is also working to make this an enterprise security solution, adding iris authentication to fingerprint and vein scanning."